Rebecca MacKinnon's postings about work, reading, and ideas from 2004-2011. Today the Web might seem like a free-speech panacea: it has given anyone with Internet access the potential to reach a global audience. But though technology enthusiasts often celebrate the raucous explosion of Web speech, there is less focus on how the Internet is actually regulated, and by whom. As more and more speech migrates online, to blogs and social-networking sites and the like, the ultimate power to decide who has an opportunity to be heard, and what we may say, lies increasingly with Internet service providers, search engines and other Internet companies like Google, Yahoo, AOL, Facebook and even eBay. It’s like if I was to concede that a benevolent dictatorship is a far more effective model for a political system than a liberal democracy. The problems you hit in that context is when the dictatorship slides from benevolence (or effectiveness), or you need a new dictator in a hurry. I love having Steve Jobs at Apple: I just can’t quite believe the odds that the next Steve Jobs will be at Apple too, and the one after that. I want to move my data seamlessly where the best ideas and implementation move. If we want people to have the same degree of user autonomy as we've come to expect from the world, we may have to sit down and code alternatives to Google Docs, Twitter, and EC3 that can live with us on the edge, not be run by third parties. How do we create viable grassroots, distributed alternatives to Google and Twitter so that if they get shut down, or turn evil, we're not left in the lurch - or in jail? At the iCommons Summit in Sapporo in August, I gave a longer version of the my O'Reilly talk, and called on the global free culture community to work together to make sure that there are enough grassroots, distributed, non-proprietary spaces for people to communicate and express themselves so that we won't be so dependent on the web's benevolent dictators. The question I have not yet managed to answer is: how do we succeed in breaking our dependence on the benevolent dictators? Or how can we help at least some of our web and telecoms dictators evolve from being monarchies to something more accountable, transparent, and participatory? Figuring out the answer should, it seems to me, be a major priority of free speech activism in the 21st century, and thus a major priority for the foundations and governments who fund them. On Friday Kaiser Kuo was on top of the news that Tudou shut down for 24 hours to "move servers." They're now back up again. All this amidst mysterious reports that Tudou had been ordered to shut down by SARFT, which Tudou public relations people had denied knowledge of. If this really was punishment originating with SARFT, then it was mighty light — really, just a wrist-slap. If it was what the Tudou party line says — ho hum, we’re just moving servers — then it’s strange that users, let alone advertisers, weren’t notified. Not to mention of course the fact that the timing was bound to get people speculating. Nobody in the industry believes the explanation of the server move: see for example this article on Enorth.com.cn which says that the server moving explanation is "suspicious" and also says that this may be the "most serious case" of a website shutting down in the history of the Chinese Internet. Speaking of timing, over the past couple days YouTubers have been busy uploading video (mainly taken from various TV news reports) about protests in Tibet... making this an excellent time for a company trying to stay out of trouble to schedule a server move - and beef up content filtering and monitoring systems while they're at it. Congratulations to Charles Mok on the publication of his new book, Hong Kong 2.0! He had a well-attended launch event on Thursday, at which he asked me to say a few words. Charles, who has become a good friend and ally over the past year, invited me to write a preface for the book. Since my written Chinese isn't up to the task I wrote it in English and he had it translated. Below is my original English draft. Many foreigners show up in Hong Kong and start drawing public conclusions about the place and its people within days of arrival. I can imagine that many Hong Kong people must be quite tired of such instant experts. Thus, as a recently arrived Westerner who speaks no Cantonese, I was surprised that Charles Mok invited me to write this preface. Yet he insisted, so I will try hard not to waste his readers' precious time. Having spent altogether 12 years living in Beijing, when I moved to Hong Kong in January 2007 I brought with me many prejudices that Beijing people tend to hold about Hong Kong. According to these prejudices, Hong Kong people are allegedly not very creative, are culturally superficial, materialistic, are easily intimidated, and can be counted on to choose profit over principle. Charles Mok is one of the many people I've met since moving to Hong Kong who have proven to me that such stereotypes are grossly unfair. In my limited experience, the most inspiring and exciting people in Hong Kong are not the tycoons, the movie stars, or the celebrity politicians. Hong Kong has many talented individuals who do not dominate the newspaper headlines: entrepreneurs, independent writers and artists, local community leaders, and many others who are doing their own thing in their own way, staying true to their ideals and beliefs, trying to make difference for the people around them. In Hong Kong version 1.0, it was the tycoons, pop stars, celebrity politicians and the media's favorite "pundits" who had most of the power and influence. In the 1.0 version of any country or territory, getting attention and having an impact was much more difficult without access to substantial investment capital, without contracts from recording or film studios, without access to a printing press or broadcasting channel, without somebody to publish and distribute your books, without journalists who agree to interview you and put your quotes in the newspaper or soundbites on television, and so forth. Now Hong Kong and all of the world's modern cities are facing the 2.0 era. Successful transition from 1.0 to 2.0 will be key for maintaining Hong Kong's competitive edge in the global knowledge economy. In a global knowledge economy, competitiveness increasingly depends on a country or territory's ability to innovate: innovation not only in terms of business, products and services; but also innovation that creates the kind of working and living environment in which the world's top knowledge workers – and their families – can live happy and healthy lives. As a cosmopolitan, multicultural city with one of the world's most highly educated populations, Hong Kong 2.0 has the potential to be one of the world's most vibrant and creative places. In Hong Kong 2.0, ideas and innovations in all fields would be able to emerge from the "bottom up" rather than from the "top down;" from the "edges" rather than from the "center" – after all, experience shows that the best business ideas and most exciting cultural innovations in the past few years have tended to come from the most unexpected places, and almost never from a government planner's desk. This is great news if you do not belong to one of the categories of famous people listed above. Internet entrepreneurs are launching startups with small amounts of pooled savings. Independent artists, filmmakers and musicians are increasingly using mobile and internet technologies to get their works known. Bloggers and podcasters who put their creations directly on the Internet are gaining popularity among young people without having to first get a TV or radio show. Citizen media groups like InMedia have used the internet to organize social movements to preserve Hong Kong's historical heritage. Journalists can publish pointed political analysis directly on their blogs, whether or not their newspaper editors dare to publish it. But as Charles Mok has pointed out in many of his essays over the past few years, it is not yet clear whether Hong Kong's legislative and regulatory structures will enable Hong Kong to evolve successfully from 1.0 to 2.0 and achieve its full potential. Is Hong Kong capable of truly taking advantage of all that its highly-educated, culturally diverse people have to offer? Or will the Hong Kong Special Administrative Region potentially squander its potential by sticking to a set of outdated 1.0 style regulatory structures and laws – a system which might favor the entrenched 1.0 interests, but which might also hold Hong Kong back while the world's most competitive cities boldly stride forward to 2.0 and beyond? The good news is that there are more ways than ever for all of us as Hong Kong residents and citizens to make our views known – both to each other as well as to the people who currently hold power in Hong Kong. In his essays, Charles describes many of those ways, and discusses many of the policy reforms he believes are necessary in order for Hong Kong to transition successfully from 1.0 to 2.0. No doubt you will have other views – you may or may not agree with everything he says. But the point is that if you want the dream of Hong Kong 2.0 to be fulfilled, it's up to you to help make it happen. Don't sit and wait for 1.0 leaders to solve Hong Kong's problems in a top-down 1.0 fashion. We have only ourselves to blame if we sit around waiting for other people to build Hong Kong 2.0, and do nothing about it ourselves. 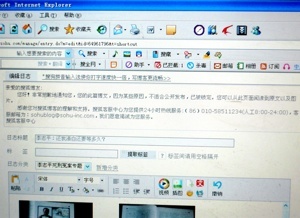 Read on for the Chinese translation (use of the terms 老外 and 洋婦 were deliberate)..
Is Web2.0 a wash for free speech in China? 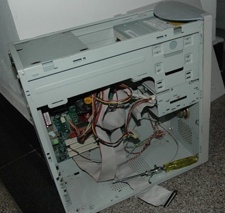 This is a picture of Zhai Minglei's computer after his hard drive was removed and confiscated on Thursday. Blogger and publisher of the recently-shut-down grassroots newspaper "Minjian," Zhai posted the photo on Friday along with an account of the questioning he had undergone that afternoon. See John Kennedy's translation of Zhai's Thursday blog post describing how his home was raided. Friday's post is a long account, which hopefully somebody will translate in full. His hard drive was returned to him, with "Minjian"-related material removed. 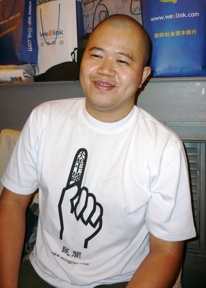 Zhai (pictured here sporting a "Minjian" t-shirt at dinner after the recent Chinese Blogger Con) thinks that the search of his home, confiscation of all back issues of "Minjian" and confiscation of his hard drive were a reaction to an open letter he recently wrote to his readers about the closure of "Minjian." The China Media Project translated much of it here. One quote: "China’s hosting of the 2008 Olympic Games might demonstrate that Chinese people are physically stronger and sturdier, but the death of Minjian reminds us that the mental horizons of the Chinese people are limited to the child’s playground. While the market is glutted with mediocre, materialistic consumer fare, public affairs news materials are repeatedly pressured and bled out." Zhai insists that his newspaper violated no laws, that its closure was a violation of the Chinese constitution, and that Thursday's search of his home was not legal. His post after Friday's questioning session concludes: "Because we've been living for so long in this mentally stunted environment, we've become used to validating this system of backward government administrative thinking. Thus we're like the frog in cold water that gets slowly boiled, slowly getting used to it, unaware of our impending death.... One phrase: Break out of the net!" In other bad news, the people involved with Me Media, a Chinese-language meta-blog rounding up the hottest blog buzz in China, report that the website's IP address has been blocked by Chinese internet service providers. In other words, to use correct Chinese netizen lingo, they've been "harmonized" by the "great firewall." Contributors say they believe the site was blocked because their latest post included discussion of the recent Shenyang ant farmer protests (yes, ant farmers - read the link for details). As John Kennedy documents over at Global Voices, people trying to post information about the protests online are engaging in an intense whack-a-mole battle with censors: the name of the company involved "Yilishen" has gone onto the blacklist that causes web pages with those words to be blocked by search engines, filtered by ISP's, and flagged for take-down by blog service providers, video-hosting sites, and chatroom monitors. As the comments on John's post demonstrate, people are forced to post information and videos related to the protests on overseas websites, even though many of those sites can't be seen without use of proxy servers, because when posted on domestic sites they are removed completely. Amidst all this, Zhao Jing, aka Michael Anti - blogger, New York Times researcher and currently a Nieman Fellow at Harvard - has given a presentation at Harvard arguing that the "golden age" for blogging in China is over. On Tuesday he gave a provocative talk to my former colleagues at the Berkman Center, in which he argued that free speech has become less and less possible in the Chinese blogosphere since late 2005, when his MSN Spaces blog was censored. (You can watch the video of his entire talk here or read excellent summaries by Ethan Zuckerman and David Weinberger.) Anti argues that since 2005, the increasingly sophisticated systems for blocking external websites, plus the co-option of private enterprises in censoring user-generated content, has rendered Web2.0 in China largely ineffectual as a vehicle for social or political change. He believes that the serious conversations, at least amongst China's urban elites, are retreating back Web1.0 tools - e-mail list-servs and chatrooms. Anti also said he believes the Internet is helping China to become more like Singapore - not more like the U.S. or other Western democracies. Chinese people, he argued, have so much more cultural and social freedom than they had before, that "at least 95% of people don't care about censorship" - and what's more, those who care are considered "wierd." Which brings us back to Ruan's angry blog post about being reported to the authorities by his fellow countryman. Contrary to misperceptions by many outsiders, the situation in China today is not "the people vs. the government." Chinese people themselves - not only regulatory authorities or people who manage internet and telecoms businesses but also many others - are helping the government to police each other because they somehow believe that doing so is in their own interests. Once there was a [Chinese] countryman who had emigrated to Australia. He had gotten an Australian passport primarily not because it was convenient for him to travel, but because he couldn't stand the feeling he got when, going through Chinese customs with a Chinese passport, the Chinese customs officials would eye him so coldly. I realized, the Chinese people are a rung lower than everybody else not because the foreigners look down on us. It's because Chinese people devalue other Chinese people; Chinese people don't treat their own people like humans." Reacting to the proposed Global Online Freedom Act, a law proposed by members of the U.S. Congress which would constrain U.S. companies from complying with Chinese government censorship and surveillance demands, Michael Anti wrote that such legislation can not change China because the root of the problem lies with Chinese people themselves. ...the US Congressional representatives...even treat the freedom of the Chinese netizens as a maid that they can dress us as they wish. This proves once again: the freedom and rights of the Chinese people can only be won by the Chinese people themselves. The only true way of solving the Internet blockage in China is this: every Chinese youth with conscience must practice and expand their freedom, and oppose any blockage and suppression every day. As long as China's urban elites continue to live well and enjoy their lives, will more than a few freethinkers and courageous souls like Zhai Minglei be bothered to challenge the status quo? Are employees at Web2.0 companies willing to stand up for the rights of ant farmers? If I was a betting kind of person, my money would be on "no." Lately I've given a few talks around town titled "Will the Chinese Communist Party Survive the Internet?" My answer - for the short and medium term at least - is "yes." Western media pundits and many policymakers have a tendency to assume that the Internet will ultimately bring democracy to China. As for the long run, I think China will change. But I doubt China's political evolution will follow the same pattern as the West. I am not convinced that, if China eventually becomes more pluralistic, it will necessarily involve the same political structures as Western democracies. Lately I've been wondering whether the Internet and mobile technologies could be major contributing factors to why China will evolve differently. I hope to explore these questions a lot more in coming year or so. Suggestions and reactions welcome. 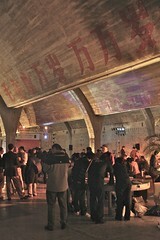 The photo at left was taken by tech blogger Keso on Friday night at the opening evening of China Foo Camp, held in an old military factory compound in Eastern Beijing (with Maoist slogans still on the ceilings) which has recently been converted into an array of trendy-arty spaces. 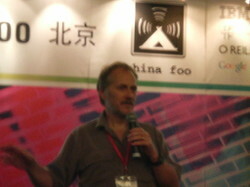 Tim O'Reilly's first foray into China was my third Web2.0-related conference in Beijing in the span of one week. Which says something about how much is going on here. It's really great to see O'Reilly and his team finally getting serious about China and making a serious effort to engage with the Chinese tech community. Naturally they will need some time to sort out who are the best people to work with in China, and how best to nurture greater dialogue and cross-fertilization between the English-speaking web world and the Chinese-speaking web world. But with the Chinese-language Internet soon to become the largest part of the global Internet, we badly need more bridges, more collaboration, more dialogue, and better understanding. The O'Reilly brand is one of many non-governmental, non-political platforms that can potentially help bridge these two worlds in ways that I hope will help the global internet evolve in a healthy and open direction that should be in the interest of the world's people - not just the world's most powerful governments. On Saturday many attendees, especially those of us who had been at the Chinese Blogger Con the previous weekend, were surprised by the 1.0-ness of the the main Saturday conference. Don't get me wrong, the local IBM team - who the O'Reilly folks chose as their local partner for this event - worked extremely hard, spent a shocking amount of money (or so people were claiming on Twitter), and deserve a lot of points for effort. They just seem to be more accustomed to interfacing with other big companies, government ministries, and state-owned enterprises than with the open source community, independent entrepreneurs, digital culture people, and techie grassroots. Still, the gathering brought a lot of interesting people together, a lot of great conversations were had and connections were made that may not otherwise have happened - which is apparently the main point of Foo camps anyway. Another thing that the conference showed was just how hard it is to hold a truly bilingual English-Chinese conference in which the Chinese and English speakers feel equally comfortable participating. Despite the hiring of interpreters and setup of a simultaneous translation booth with headsets for people to listen to translations in the main hall, non-English speakers still reported feeling like they weren't able to participate fully or understand fully what was going on, and many left early. As some people pointed out, it's not just about language - it's also about communication style, and whether you set up a gathering to favor people who are comfortable communicating in an American way or in a Chinese way. So if the O'Reilly conferences intend to be a successful bridge between the two worlds they will definitely need to pioneer new models for English-Chinese bicultural interactive meetings. It will allow China to deliver better software faster. It will allow China to build better companies more quickly. Our community cultures are different, and we need to understand each other's cultures to build the relationships to allow us to build a bigger community. Isaac Mao gave a talk about how people are using Web2.0 and "micro-content" to create a living "social brain" which grows smarter over time as we contribute to and interact with it. He has some blog posts related to these ideas here (Chinese) and here (English); also see a couple of his recent presentations on Slideshare here and here. Tangos Chan of China Web2.0 Review had some interesting perspectives on Chinese Web2.0 innovations to keep an eye on (i.e., going beyond copying American models): A growing number of Chinese Internet users, especially newcomers to the Chinese Internet, prefer to do as much of their online business in their chat client, and thus chat clients - as well as applications that feed content into both your chat client as well as into your mobile SMS mailbox - are an interesting thing to watch. Two variations on that theme are Anothr and Jiwai. Benjamin Joffe of Plus Eight Star who works closely with Orange Labs gave a very useful overview of Web2.0 and "information arbitrage" across Japan, Korea, and China. Orange's Nicholas DuCray described his research on "how community services and web 2.0 applications converge with the traditional media and mobile industry to offer a new generation of interactive services." The difficulty in measuring audiences in China also makes it hard to "monetize" traffic and grow businesses. Nonetheless, as he wrote in his talk summary: "We have had the opportunity to observe significant changes in behaviors, and the appearance of a new generation of internet users, whose primary objective is to communicate with their peers, express and showcase themselves, by any means. This need for interactivity, enabled and catalyzed by the economic growth and the development of the internet and mobile markets, has created a "hot pot" of convergent services, which could possibly draw the image of what the telecom services and the business models of the future could be." He wasn't the only one to emphasize mobile. Which I guess isn't surprising since he works for Orange/France Telecom, but then again, it's a fact that increasingly Chinese people will be interacting with the web via mobile devices and not via PC. A number of speakers pointed out that regulation and control on content, combined with lack of open API's are both obstacles to innovation. Yao Yonghe of 51.com (a social networking site popular in smaller towns but which more urbane geeks seem to turn their nose up at) reminded us all that compared to 10 years ago, white collar elites are no longer the majority of Internet users in China and thus the tastes and needs of more rural, less globally-connected Chinese will increasingly be driving the market. Having gone over my notes from that conference, I am reminded of Tim O'Reilly's remarks at Foo Camp about future trends. He predicted we will see a slowdown in what people would define as "Web2.0 innovation" as the big players consolidate. Meanwhile, "innovation will break out in some very unexpected places." Despite the fact that he expects this innovation to be unexpected, he pointed to some possible directions he thinks this innovation might come from. They include what he calls "open mobile...a kind of ambient computing where we break out of PC computing completely." The next phase of computing, he believes "is re-engaging with the physical world." This could happen in China in an interesting way, and perhaps differently than in the West. Meanwhile, I wonder: is the next phase of the Internet going to make the world even flatter or will we see the geographical, cultural, political, and linguistic boundaries getting stronger? Will we start seeing substantially different media forms and communication norms emerging in different countries depending on their economic, cultural, political, and linguistic conditions? Possibly. We're certainly finding that the big multinational Internet players are struggling to capture the Chinese market, and while politics and regulatory hurdles don't help, perhaps we're also getting to a point where one-size-fits all is increasingly untenable and homegrown services will increasingly have an edge over transplants. But as co-founder of Global Voices and a strong - perhaps overly idealistic - believer in the need for a freer, more open conversation amongst the citizens of our entire planet, I also hope that the developers and engineers of the world will continue to work hard to make a global conversation possible. I started this post talking about the urgent need to build better bridges of conversation and collaboration between the Chinese language Internet and the English language internet. Which brings me back to the Chinese blogger conference and Zhang Lei, founder of Yeeyan, a peer-translation community website. I am so excited about what Yeeyan is trying to do that I'm happy to plug it. The idea is to "crowdsource" the translation of articles and blog posts back and forth between English and Chinese so that people who don't read both languages can gain better insight into the ideas coming from each community. (It's kind of a for-profit cousin to what the Global Voices Lingua projects are doing: recruiting volunteers to translate Global Voices English-language content into a variety of languages.) So far Yeeyan has been doing well with English-to-Chinese but have had less success getting people to translate from Chinese to English. I hope they find a way to make it work. Maybe the folks behind the Chinese Content Project, which generated a great deal of enthusiasm at the beginning of this year before it ran out of steam and kind of died, may be interested in trying out Yeeyan's community translation framework to see if it can support a more sustainable peer-translation model. China O'Reilly Foo Camp - no [email protected]#! Tim O'Reilly is here in China for the first ever China Foo camp. I had to post this from my mobile because IBM, the local organizing partner, was somehow unable to organize a wireless internet connection! UPDATE: I managed to hook up to a landline and am now broadcasting a signal via my MacBook Pro to other people in the room. UPDATE2: After lunch they finally got a wifi signal working in the main hall. For a while they were projecting a live chat via Jiwai (same as they used at CNbloggercon) but then it stopped. That conversation continues online though. For those readers of my blog who don't yet read Chinese, the character in this graphic means "person." After attending the 3rd Annual Chinese Blogger Conference which is one of the most egalitarian conferences on the planet, you get spoiled. Then you go to a more corporate-oriented Web2.0 conference where executives and business school professors talk about Web 2.0 as the latest way to deliver products and advertising to customers and viewers, and you get highly annoyed. As a user, I don't consider a business to be truly 2.0 unless it has transformed its relationship with its customers and users from a one-way relationship to a give-and-take among equals. Treating human beings like a "market" to be "exploited" is 1.0 thinking. 2.0 means replacing the word "market" with "community." If you really want to be a 2.0 business, you need to become a respectful, participating member of your community. Otherwise, you're still a 1.0 business trying to use 2.0 tools in a 1.0 way. On a recent trip to Beijing I visited Liu Xiaoyuan, a lawyer who is suing the Chinese web portal and blog-hosting service, Sohu, for censoring several of his blog posts. He wrote about our conversation here. The International Herald Tribune has an Associated Press article about him this week here. Liu argues that Sohu violated its own user contract by censoring his posts - since his posts discussing various legal issues did not violate any law, and did not fit the description of type of content that Sohu's user agreement says must not be published. Liu's case was thrown out by the Haidian district court in Beijing, but he is appealing to the Beijing No. 1 Intermediate Court. The odds on his appeal getting much of anywhere are considered rather long. Liu's office is a dusty low-rent affair in a rabbit-warren of offices inside a hotel, inside a shopping center across from Beijing's West Train Station. Liu is the classic pulblic-defender type who you can find in many countries: dogged, determined, believing fervently in everybody's right to legal defense and a their day in court. China has a constitution and a legal system and he takes them both seriously - along with the rights that they are supposed to grant China's citizens. He defends people accused of all kinds of crimes who don't have connections or resources to hire fancy lawyers. He says a foreign journalist recently asked him why, as a Communist Party member, he was defending people accused of theft or murder. He says there is no conflict: after all he is serving the people, isn't he? Liu's experience is very consistent with the system of internal censorship carried out by Chinese blog-hosting companies as described by Reporters Without Borders' latest report, "Journey to the heart of Internet censorship." The report describes how Chinese Internet companies, especially blog-hosting companies and others dealing with user generated content, are required to police and censor their users in order to keep their business licenses. It describes how all web companies have a section or department for monitoring and censoring user content, how executives of all Beijing-based web companies are required to attend weekly meetings with the Internet Information Administrative Bureau. 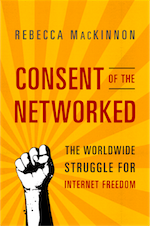 It also describes - which is consistent with what I've heard - that the first line of control over web content is directed to a great extent by the city-level Internet authorities, which results in wide variation over the extent and methods of censorship by companies based in different cities and provinces. Chinese internet censorship has two parts, external and internal: a filtering system blocks external websites from being seen by people inside China unless they use circumvention technology like proxy servers; the internal system controls content published on websites hosted on computer servers inside China. That first part is what people call the "great firewall of China," (which researchers point out is not a real firewall) that controls access to external websites by people inside China. This filtering system is well documented by the Open Net Initiative and others. The system Liu experiences every day, whose internal workings Reporters Without Borders describes in its report, is part of the internal censorship system. This system of internal, company-level controls which began to take shape in 2005 is more thorough and irreversible than the externally-directed "great firewall" system. Content posted on websites hosted on servers overseas can't be taken down by Chinese authorities (unless they successfully pressure foreign companies to take it down), so generally if an Internet user knows how to use a proxy server, they can still access the content. Under the internal control system, authorities pressure web companies and service providers to keep certain kinds of content off the web altogether - to the greatest extent possible. 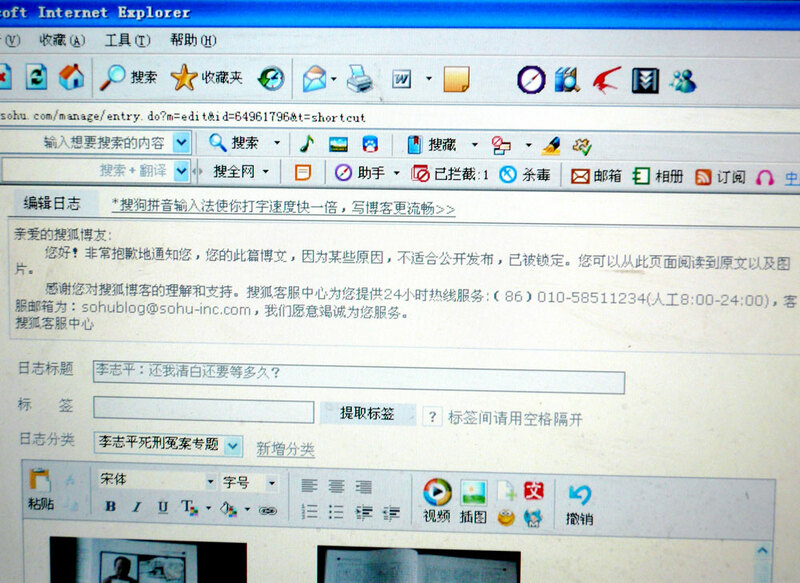 The reason why thousands of Internet Data Centers (IDC's) were shut down beginning last month in the run-up for the politically sensitive 17th Party Congress was that the websites hosted on them were not adequately able to control their user generated content in the way that Sohu, Sina, and the other big Web2.0 companies do, under the "guidance" of various government and Party departments as the RWB report describes. Just as China's filtering system of external websites is unparalleled in the world in terms of its success and complexity, so is China's internal web censorship system. In effect, the Chinese government co-opts the private sector into doing its censorship work. It is a model which I am sure many governments around the world will be eager to emulate if they aren't already doing so. Web2.0 is starting to pick up in Hong Kong - at least in certain quarters. Angus Lau, Hong Kong's main Web2.0-blogger, reported on Hong Kong's first-ever Web2.0 conference earlier this month - which I missed. Angus said that while it went better than he expected, it was mainly an intro to Web2.0 for people who know little or nothing about it. Today I went to a Hong Kong Web2.0 seminar in Cyberport organized by Diantang Communications. It was a small event - just a few dozen people in the audience, and it seems that a good number of those came from Web2.0 startups. The seminar program was unfortunately posted on Diantang's site in the most blog-unfriendly format, PDF, so you'll need to download it in order to read the whole thing. Web2.0 guru Tim O'Reily was invoked frequently. Somebody pointed out that Web2.0 is more than using lots of Ajax - rather, it's about creating and facilitating conversations, and enabling the user to use, combine, define, create, and react to content the way he or she chooses. A major focus of the afternoon was on how to find more effective ways to monetize the participatory, user-driven, mash-up aspects of web2.0. Is there a business model beyond getting bought by Google or Yahoo? How do you become the next Google instead? 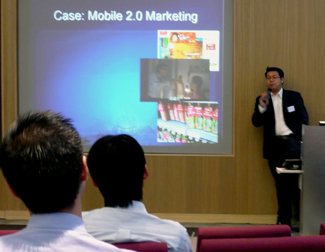 The most interesting talk to me was by Keith Li from m-gen.com, a "mobile 2.0" company. He described how mobile users use the web very differently than people who access the web from computers. They tend to be the people who aren't doing white-collar office jobs with computers at their desks, but rather people with the kinds of jobs that require them to be outside or on the road or running around a restaurant, or whatever it is, and don't have much internet access at home either - or not the kind that makes private or personal conversations and interactions possible. These people find it worthwhile to pay subscriptions for mobile web services. His company developed a mobile blogging site which they then sold to a company targeting Singapore, Malaysia, Thailand, Indonesia and Vietnam. He commented that it's interesting how companies in South East Asia seem to have more "insight" than those in Hong Kong when it comes to utilizing these technologies. Many times, what potential users want isn't nearly as fancy as startup guys think. Coming January 31st, 2012, from Basic Books. To pre-order click here. Tunisia and the Internet: A chance to get things right?